Families and new students seeking admission to grade 1 through grade 8 on a space available basis must submit all prior school records for evaluation and be personally interviewed by the principal and faculty representatives to determine if Saint John Catholic School can satisfy the academic needs of the students. The Birth Certificate and Baptismal Certificate must be presented at the time of registration. Registration is not complete until all the necessary paperwork and a non-refundable registration fee is submitted. The school will give preference to current students by allowing re-registration each year prior to registration for new students. Accordingly, first priority will be given to students currently enrolled in Saint John School, who successfully completed the Kindergarten Program or their previous year of school study, and who re-register. 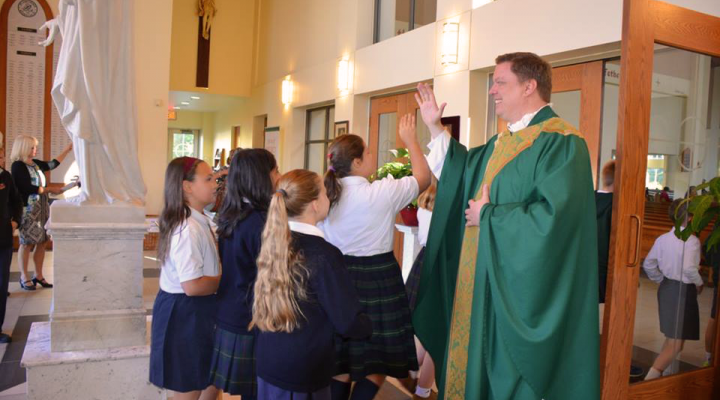 In the event there are more qualified candidates than available admission openings, the admission priority will be given to the children of families who have been registered and participated in the parish envelope system for the longest period of time prior to the year of the new child’s admission. Admission from any of the pool of candidates set forth above will be made in the sole and absolute discretion of the principal and the pastor. After new student registration, students will be admitted pursuant to the admission priorities. If a class is completely filled, parents may place students into the pool of non-admitted candidates. Parents of a child in the pool will be notified during the school term if a place becomes available. However, siblings of a student who gains entry from the pool shall not enjoy a priority status for the remainder of the academic year for which the student was admitted. When registration opens for the following year, the student admitted from the pool, pursuant to the admission priorities, shall be allowed to re-register and the application of any sibling of that student shall be reviewed in accordance with the priorities. In order to meet the individual needs of each student, we must first assess a student’s level of academic development. If a child’s record of academic achievement is incompatible with the program presently administered in the school, then it will be impossible to enroll that student. To enable St. John School to perform an adequate record check, parents should provide any report cards and/or information from the prior school. Upon receiving an application for registration, Saint John School will send for the records of the student from the prior school. Admission is predicated upon receiving all previous school records prior to matriculation at St. John School. All new students accepted in Levels K-8 are given a 2 -4 month evaluation period. If during this time, the principal determines that the school is unable to meet the needs of the student, the parents will be required to place their child in another school. Such a recommendation would occur after a conference with the parents. All medical records must be up to date as required by the Carroll County Health Department. Each student MUST have a current emergency contact information on file in the school. Parents’ home telephone numbers as well as information on any health problems a child may have MUST be on file. This information must be updated through the year as changes occur. All financial obligations must be paid.